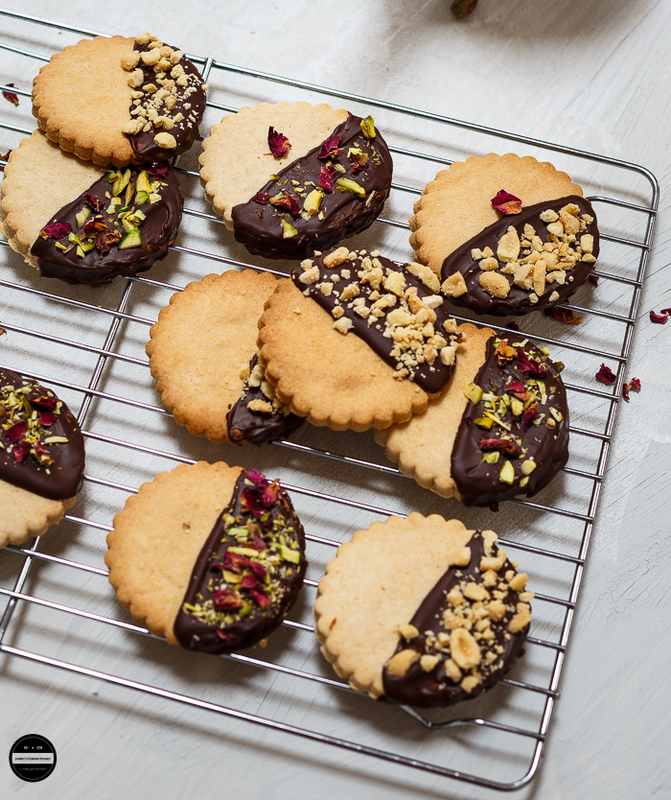 Stay in your Valentine's good book for another year with these magnificent Chocolate and Salted Peanuts, Shortbread Cookies! A simply awesome Valentine recipe. Whether you love it or loathe it, the official day of all things heart-shaped, rosy and sugary sweet is on our doorstep. If you guys need a hand for any last-minute Valentine's day treat, bake my super tasty and amazing shortbread and make this Valentine's day extra sweet as the month of February is right here and heartfelt fare romance is in the air. 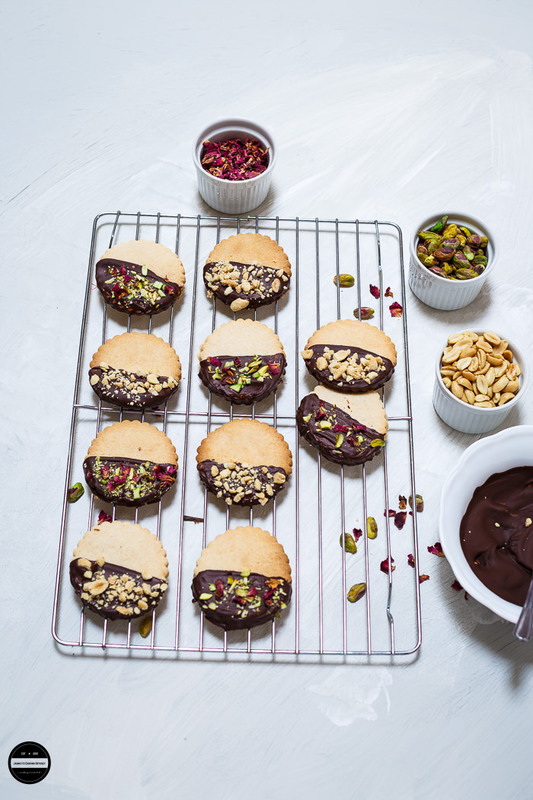 This dark chocolate dipped soft and buttery shortbread cookies are eggless, insanely delicious and incredibly easy to whip up. These are perfect for Valentine's day treat or just gobble up whenever you have intense cravings for some delicious cookies or biscuits! I baked a small batch of these yummy and satisfying cookies over the weekend for my family and we enjoyed it together. I thought salted peanuts and chocolate would bring a little variation, as my daughter always prefer her popcorns sweet and salty together, halfway while I was dipping the cookies in a melted chocolate and sprinkling crushed Salted peanuts, my mind suddenly drifted into Valentine's Day and this gave me the idea to use some dried rose petals and pistachio also as toppings . These shortbread cookies are great as a gift too. 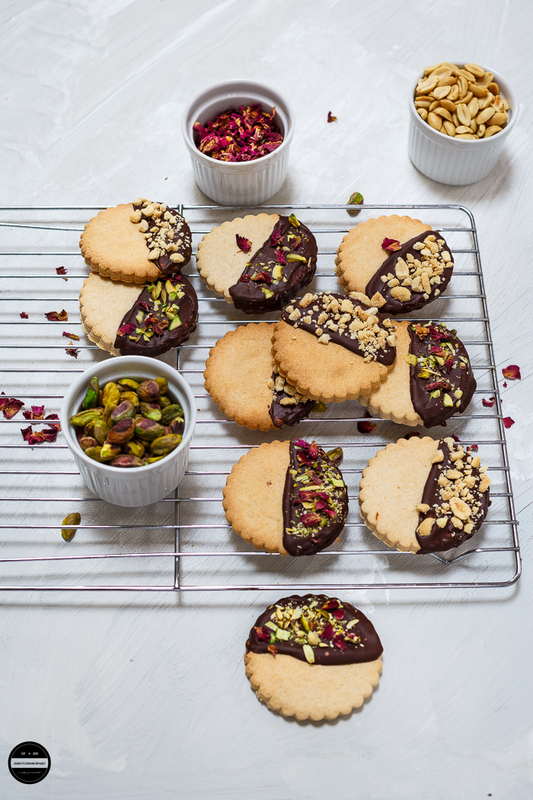 Treat someone special with these delicious dark chocolate dipped Salted Peanut Shortbread Cookies! Mix all the shortbread ingredients ( flour, butter, sugar, cornflour and peanut butter) in a big bowl until the mixture comes together. Knead lightly, cover with cling film and refrigerate for an hour.Pre-heat the oven to 180C/355F or Gas Mark 4.Knead briefly after removing it from the fridge.Roll flat to about 1/2 " thickness cut the biscuits out Lay out on a non-stick baking mat or baking parchment.Allow some space between them for expansion.Bake until golden brown around edges, about 12-15 minutes. Remove from the oven and allow to cool completely before decoratingOnce shortbreads are totally cooled melt the chocolate and dip half of the shortbread cookie into the melted chocolate and place back on the baking tray with parchment paper.Sprinkle with the crushed salted peanuts or pistachio and rose petals onto the chocolate cover side immediately. 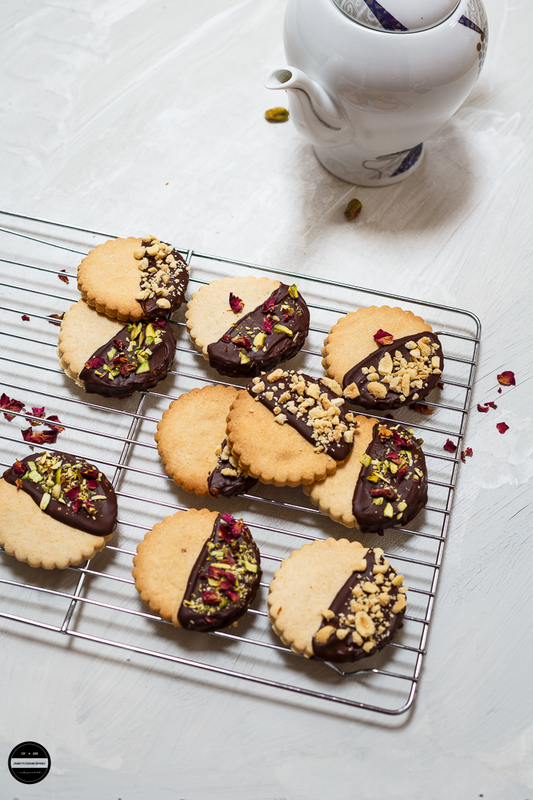 Repeat with all the remaining shortbreads and let the chocolate set for 20-30 minutes.Enjoy on its own or with a cuppa. The cookies look so attractive and inviting. 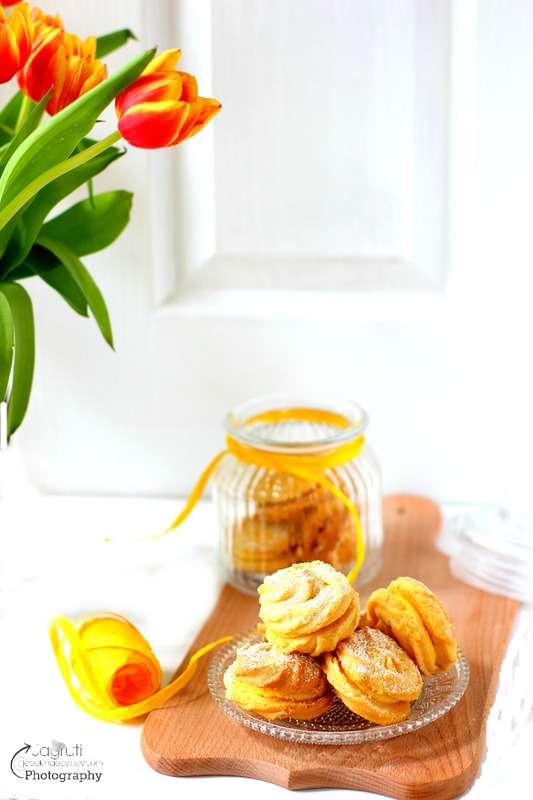 Love your biscuits and your presentation. It’s a bonus that these are eggless . Loved the addition of salted peanuts that would definitely elevate the taste when combined with chocolates. A perfect recipe for loved ones, gifting ideas or just ideal as kids lunch box idea.. Beautiful images and you tempt me forever Jagruti! Absolutely, salted peanuts are the highlights of these cookies :) Thanks for your lovely comment Vidya. 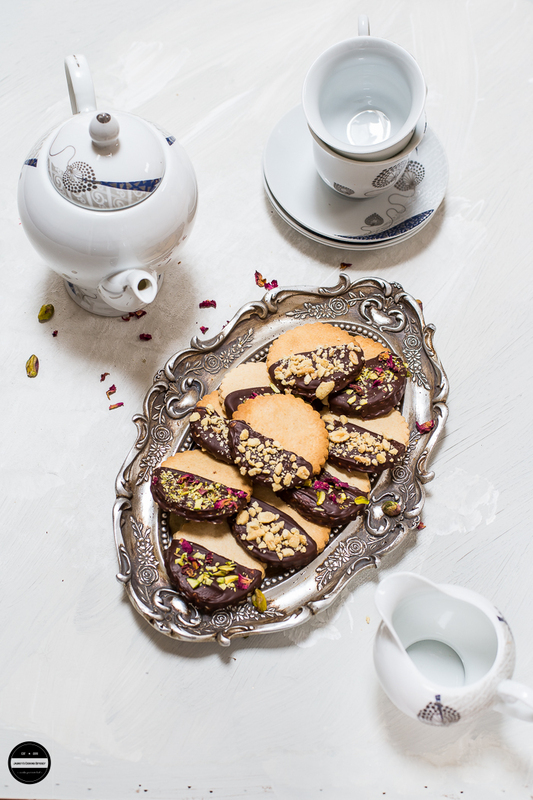 Wow Jagruthi, those peanut butter shortbread cookies look absolutely stunning. I want to make them right away :-) :-) Love the addition of peanut butter to shortbread cookies -- sounds sooo delicious. Thanks Pavani. Yes, peanut butter lends little nuttiness to the cookies. If ever I get a chance to rob your house then first thing inwiI pick is your kitchen utensils, your camera .hey what about kidnapping you also. 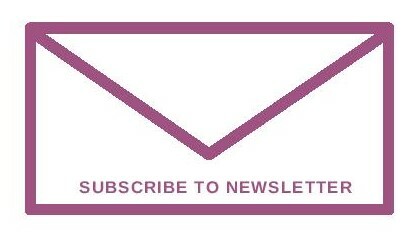 You always win the hearts of many by your recipes, clicks and lively write up. These short bread cookies. Uff, I wish London was not so far. hahahah, thank you Nivedita :) I am speechless here! You are always welcome here. These look delectable and I would not mind receiving a boxful. Afterall valentines day is for family and friends too! I love the addition of the nuts. These cookies look devine. Adding salted peanuts to chocolate sounds great. Love the crockery too. Prefect treat for your lunch ved one this valentines. They looks so pretty and delicious. Those cookies looks so delicious and very tempting with chocolate and salted peanuts.Lovely pictures too. Cookies looks amazing. Addition of salted peanuts must tastes awesome . Excellent photography Dear. These look so yumm. I am tempted to try these now. Looks totally addictive ..I am definitely going to try this out...Bookmarking.. 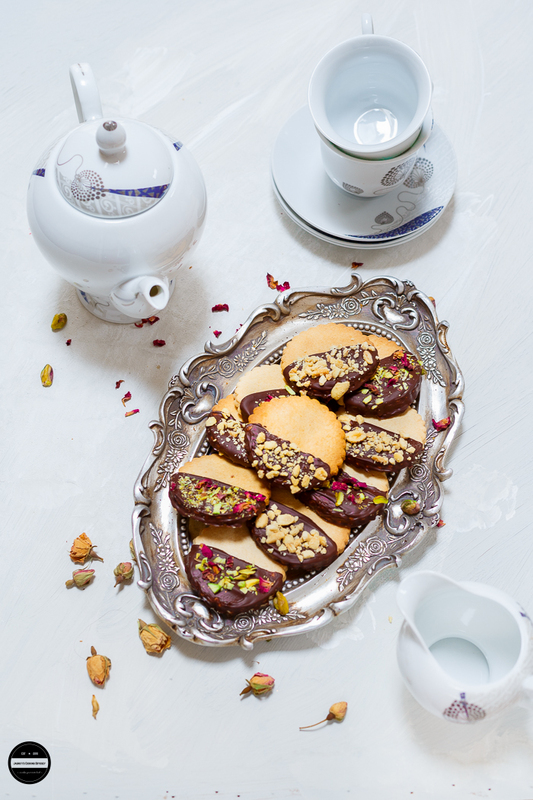 These look irresistible!Such a magical creation...love the pairing of chocolate and salted peanuts!